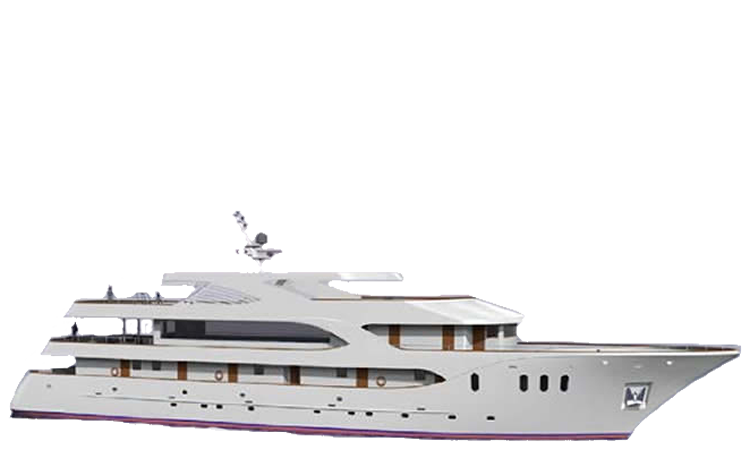 How do you like the idea of sailing on your “own” private yacht? Many of our customers have already discovered – and we definitely agree with them – that the most beautiful way to experience a unique cruise is, when you charter a boat together with family or friends, to explore the Croatian islands. With a little bit of imagination, the ship will become your own yacht. Do not be surprised should you encounter some of the world’s most superb and luxury yachts during your tour in Croatia. Famous people and celebrities from all over the world love to spend their vacation, cruising the amazing island world of Croatia. With your own chartered boat including captain and crew, you can enjoy a vacation just like the rich and famous. If you do not have a full week’s time, but still would like to charter a boat, feel free to contact us. We will gladly sub- mit an offer for shorter charter trips. When chartering a boat, you may arrange your personal itinerary according to your interests and desires. Just let your captain know which places you would like to visit. If desired, you may choose to spend the nights in secluded coves instead of anchoring in ports or harbours. In this case, we recommend that you book full board instead of half board, as there will be no possibility to go out for dinner when mooring in a cove. The adjacent example shows how the charter price calculation is done if you book a combination of half board and full board. Would you like to experience more than sun, wind and sea? There are numerous possibilities to enhance your charter cruise. How about guided tours to cultural and historical monu- ments? The UNESCO towns of Split, Trogir and Dubrovnik offer fantastic points of interest, just like Krk, Rab, Zadar, Šibenik, Hvar, Korčula… each location offers a wide range of tourist attractions. You decide whether a tour guide will be waiting for you in each port of call, or whether he or she should accompany you throughout the entire cruise. It would be our pleasure to organize bus tours for your group. The excursion through the Neretva River Delta to Mostar in Bosnia-Herzegovina is a great example. Another amazing trip leads to the world-famous Plitvice Lakes National Park. On our itineraries, you will get to see a number of famous national parks. 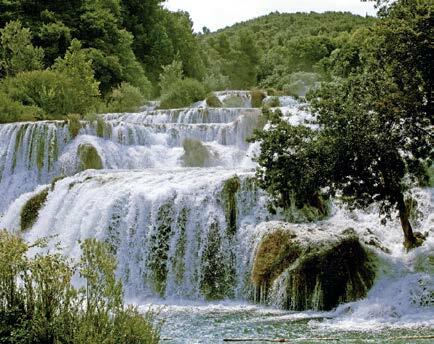 The steep gorges of Paklenica, the magnif- icent Krka waterfalls, the Kornati Islands – unique in the world – or the saltwater lakes on the island of Mljet. Just tell us what you would like to explore and we will gladly submit a tailor-made offer. The Adriatic Sea is actually a peaceful ocean. If, by any chance, some strange looking pirates should be cross- ing your route, you can be sure that they do not have bad intentions. 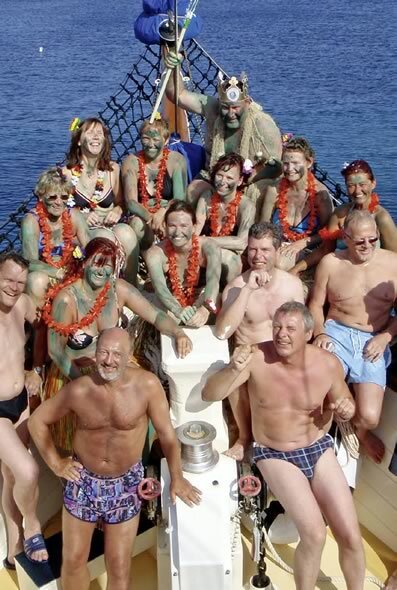 In this case, you will be facing a cheerful group, who has chartered a vessel for a few days to have some fun. Our ships are ideal for clubs and groups, who are planning their next holiday. Soccer or bowling clubs, sports clubs, large families or simply a group of good friends – with our boats for 14 to 40 people, you will surely find the right ves - sel to suit your needs and wishes. A few years ago, a brass orchestra chartered one of our boats and gave a concert in every port of call they visited. Imagine the surprised looks of the accidental audience ashore, when suddenly trumpets, horns and trombones were being played on deck. Many guests celebrated their birthday or anniversary, cruis- ing together with family and friends. The event we were most excited about, finally took place in July 2013. 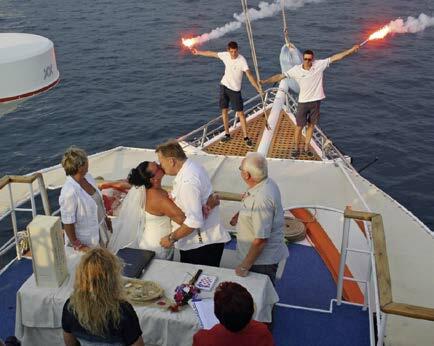 A couple from Austria got married on the MS Dalmatino. 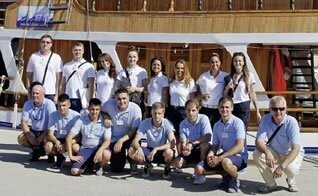 After the wedding ceremony and a royal outdoor dinner at a beau- tiful park in Zadar, the newly-weds and 20 invited guests set off for a one-week cruise through the northern part of Dalmatia. “Good food is a blessing for body and soul!” – This old say- ing definitely applies to our cruises. The served meals are made out of fresh and high quality ingredients. 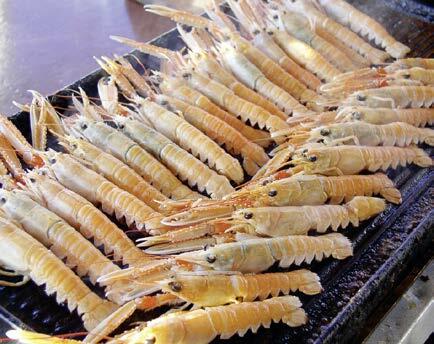 The menus traditionally include soup or appetizers, meat dishes or fish, fresh vegetables, salad and dessert. For any special requests, simply inform the captain in time and your culinary desires will be fulfilled. If you feel like eating freshly caught shrimps or if you fancy to grill a lamb over an open fire in a secluded bay – be assured that your captain will make it possible. These extra meals are subject to be paid directly on board. The shore excursions in the evenings always offer great opportunities to discover culinary treasures. Enjoy the taste of grilled fish in typical local taverns, called “Konobas”, or “slow food” in the ambiance of exclusive restaurants. Did you know that I.D. 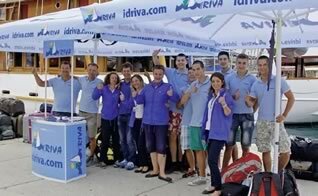 Riva Tours actually was the first tour operator ever, who started offering bike & boat arrange - ments in Croatia, also known as “Island Hopping by Bicy- cle”? By now, we combine our cruises with guided bicy- cle tours to beautiful islands on eight different itineraries. Island Hopping is also possible if you decide to charter an entire vessel for your group. In this case, you may choose one of the routes from this catalogue, or you can feel free to create your own programme. 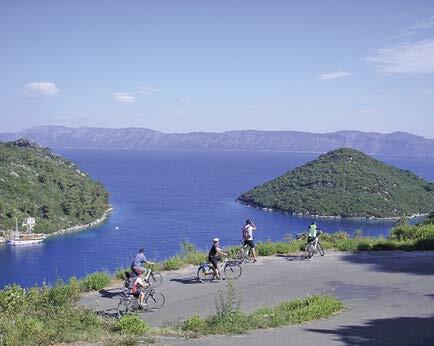 “Island Hopping by Bicycle” is of course not the only way to enjoy an active charter cruise. If you want to discover the islands on foot, our experienced guides will lead you along the best tracks and show you some magical places. If you fancy even more action, kayak safaris and rafting tours are definitely the right activity for you. The rivers Zrmanja near Zadar and Cetina near Omiš are very popu- lar kayaking and rafting locations. Our boats are also an ideal setting for seminars, workshops and team building events. Since 2005, the ITHAS* takes place almost every year on five or six boats. This event is organized by the University of Zagreb, in cooperation with the universities of Munich (Germany), Jyvaskylä (Finland), Barcelona (Spain), Ljubljana (Slovenia) and Brock (Ontario, Canada). Every year, more than 100 stu- dents and 10 academics join the Academy to learn about tourism in real life situation. On a charter cruise, you decide where the journey is head- ing… of course we know that along 5,835 kilometres of coastline and 1,185 islands and islets – the choice is not always easy. If you do not want to follow one of the featured routes in this brochure, just tell us your ideas. 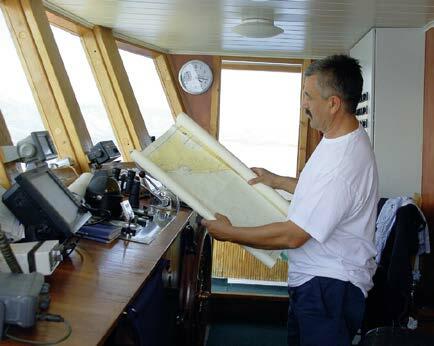 Together with the cap- tain and our team on the spot, we will plan your personal itinerary in advance. Our charter rates are based on an average daily sailing time of five hours – 35 hours a week. Of course, you can spend a whole day in a bay or port of call and extend the sailing time during the next days. Keep in mind while planning, that our boats are sailing exclusively at daylight. Of course, cruises with longer sailing times are possible as well. Please request a quotation.